It’s funny how we are all connected. I’ve known designer Rosanna Ocampo for a really long time. Our fathers were good friends, I would play badminton with one of her brothers (sometimes he would let her tag along and play with us) and she married a childhood friend just early this year. It had never occurred to me that she would be a designer. In fact, when I told my mom that I had started buying dresses from her she said in shock, “What? That little girl is a designer now? !” Yes, that “little” girl had just come back from five formidable fashion years in Europe and had returned to make her own mark in the local design landscape. I had not seen Ocampo in ages but about three years ago I was in the market for travel-friendly, yet stylish clothes and her name came up. As fate would have it, I bumped into her at an event and later that week found myself at her atelier, leaving with three delightful dresses. 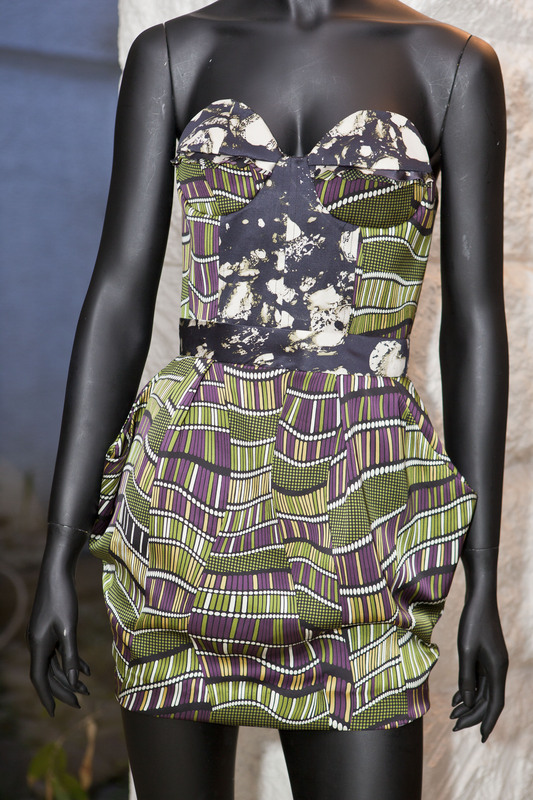 I felt her choice of prints was youthful and fun, and the fabrics she used were versatile. They were perfect to wear alone with sky-high heels or (due to her preference for thigh-skimming skirts) for layering in colder weather over tights and boots. The pieces traveled well, too: I just pretty much threw them in my bag and threw them on once I unpacked and I was good to go. Nowadays, it’s pretty difficult to miss one of society’s fash pack in an Ocampo creation. She runs with a pretty stylish set, and knows how to have a good time, throwing back a cocktail or two (or three) and hitting some of Manila’s hottest nightspots with her husband and friends. She can definitely party hard, but unbeknownst to many, she works even harder. “I knew I wanted to be a designer since I was 13 or 14 and have been designing my own dresses ever since — I did my own prom and ball gown,” she shares. Even with this early passion for fashion she stayed dutiful daughter and completed her undergrad in the Philippines (finishing a business degree) and finally left for Milan to pursue her “true love” in 2003. During her studies she embraced la vita bella, completing a degree in fashion and textile design as well as a master’s in fashion promotion and had the opportunity to meet design deities such as Giorgio Armani, Roberto Cavalli and Domenico Dolce. As if this wasn’t enough she went on to do a summer course in draping at the Paris American Academy and then worked for the Livia Gregoretti Showroom for a year and a half. Now, with all that under her belt, what’s a worldly girl to do? Come home and work harder than ever. Manila may not be Milan but Ocampo has no complaints. Her collections are virtual sell-outs at every trunk show and her latest one, called Studio 54, is no exception. If you want to add some sparkle in your wardrobe then you can choose a high-shine jacket such as Ocampo’s favorite piece “The Jacko” that boasts a sequined lapel and metallic brocade or the “Ross” frock that coats you in liquid gold allowing you to shimmer with every shimmy. For the not so flashy, there are jumpsuits with just a hint of bling or dresses with multi-textural fabric and prints, allowing for some daring details without going overboard. 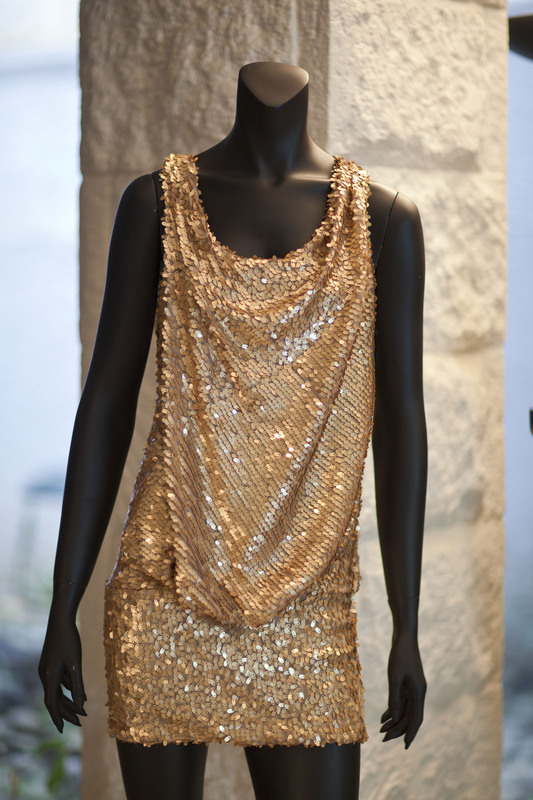 During this particular trunk show I was happy to connect with my inner party girl, fantasizing about where I could wear the Vreeland minidress and dance the night away or meet up for a cocktail with my girlfriends in a monochromatic Minelli Block Fantasy shift. I often teased Ocampo on her penchant to shorten the length of my skirt or deepen the neckline of my top and once she quipped back, “Because Kat, I never want you to forget to have fun.” A timely reminder. It is true, as we grow up, we condition ourselves into believing that certain things should no longer be done. Having fun, with who you are and what you wear, should definitely not be one of them. As I watched swirl after swirl of shiny fabric whisked off the racks and into another gleeful lady’s arms that day, I realized that, hey, we all deserve a chance to shine and a fabulous dress to wear while doing it. Love the disco diva dress! !